← The cost of the coming Election. What informed the decision to map Kibera? Who were involved? How did it happen and what made you guys decide to start Map Kibera Trust? This is the closely related Questions that brought about a wonderful discussion at the Map Kibera Trust office during the visitation of the Amnesty International guests from Ghana, Nigeria, Zimbabwe and Kenya as well. Before we could start the presentation of what we exactly do, as it is conventionally, everyone had to introduce themselves and it indeed was evident that the visiting group had eagerly anticipated this visit for there was more to learn. During the introductions, one of them; Fubara Samuel introduced himself and when he said he was from Naigeria, I remember while thanking him i said “Thank you for the introduction ‘Oga hooh!’” this made everyone to laugh but I said to myself quietly that “This is a good dose to bring everyones’ concentration specifically to the work that we were just about to present”. The mapping program presentation was the fast to be done and questions I have never witnessed in a long time were asked. Was it a good thing that many questions were asked? Was the time really enough to explore all aspects of our work? 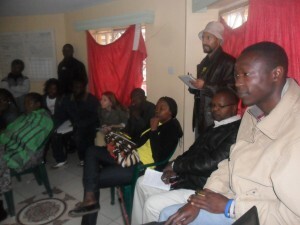 Did the Map Kibera Team meet some of the expectations for the Amnesty team? Your guess is as good as mine but reading the mood of the participants there was clear understanding which facilitated the kind of discussion that happened today; which was a good thing in my view. i. Not only do we need to work with leaders in given communities but also involve the community members too. This was a problem that the mapping initially experience but later learnt from it and now active community participation is key in ensuring data/contend is well generated. ii. Seeking governments support was also identified to be of utmost importance for without their support nothing much can be done, so for us we have been able to get the local leadership on board in understanding the broader perspective of the work we are engaged in. 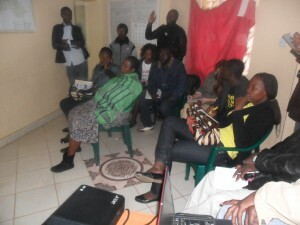 In conclusion, all the 3 programs had a chance to present what they do, and basing on the fact that there was much interest in Map Kibera Trusts’ work as witnessed in the participatory discussion, there are greater chances of doing this work in Nigeria as well as working together with Amnesty International. My only hope is that, time will bring home this reality of working together with Amnesty International and or on a project in Nigeria. This entry was posted in Education, Empowerment, People, Security and tagged Amnesty International, Ghana, google.com, Kibera, Nigeria, safaricom, voiceofkibera.org, Zimbabwe. Bookmark the permalink.